Harold (Tom) Tucker passed away yesterday morning. 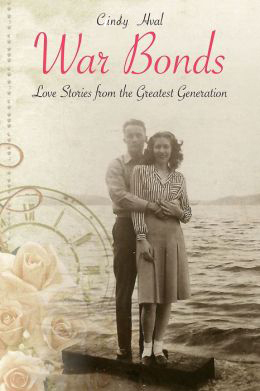 His and Shirley’s story is the final chapter in War Bonds: Love Stories from the Greatest Generation. This couple is especially dear to me. They attended every book signing they could make it to, shared their story on public TV in a Northwest Profiles episode, and fielded questions from military service members past and present at the Spokane Veterans Forum. It hurt Tom to speak of the things he saw when his ship, the USS LaGrange, was bombed two days before the end of the war. But he spoke of the wounded and dying men he tried to help. It was important to him that their sacrifice would be remembered. Following his service during WWll, Tom became one of the first motorcycle police officers in Spokane, Washington, and despite the seriousness of some of the stories he shared, he always made me laugh. My thoughts are with Shirley today. “She’s the other half of me,” Tom once said. Shipmate you stand relieved. We have the watch. I was so delighted to see this photo of Harold (Tom) and Shirley Tucker celebrating their 72nd wedding anniversary on November 12 at North Hill Christian Church in Spokane. The Tuckers are featured in chapter 36 of War Bonds: Love Stories From the Greatest Generation. I would have loved to have included the Tucker’s story in War Bonds but I just met them last week. Stories like theirs are so worth telling. During the 1940s and ’50s many lasting love stories began in a roller rink. That’s just what happened to Harold “Tom” Tucker and his bride, Shirley. It was spring 1944 and he and other sailors on leave often took a bus to Cook’s Roller Rink (now Pattison’s). Shirley, 17, was a senior at North Central High School. When she skated past, Tom noticed. “I saw her and I though, WOW! I gotta meet that lady!” he said. Tom laughed. “She just liked sailors,” he teased. “Oh stop that!” his wife retorted. A few weeks later he showed up at Cook’s again and quickly sought her out. This time he asked for her address and phone number. They skated every couples skate together and held hands. “Oh boy! That was fun!” Shirley said. Her parents weren’t thrilled about her dating a sailor, but they figured the youthful romance would quickly blow over. In August, Tom asked her father for Shirley’s hand in marriage. “I was madly in love by then,” she said. Shirley was heartbroken, knowing Tom would soon be sent overseas. “I cried and cried,” she said. But when Tom shipped out for the South Pacific, she still didn’t have a ring on her finger. A flurry of letters ensued and when Tom got a 10-day leave he bought her a ring and mailed it to her. Also serious was the trauma that Tom was about to endure. The 19-year-old hospital corpsman was stationed aboard the USS LaGrange and anchored at Buckner Bay near Okinawa. One night, 13 Japanese twin-engine bombers attacked. Then on Aug. 13, 1945, two days before the war ended, the LaGrange was attacked by two kamikaze pilots. One plane struck the ship and damaged it before crashing into the water. The other, carrying a bomb, plunged through the ship and the bomb detonated. In the following hours, Tom did his best to care for the wounded and dying. “There was fire on the deck – so many men were badly burned. One guy asked for water. I gave him a sip and held his head while he drank. The back of his head came off in my hand. He died 30 minutes later,” said Tom. “People really don’t know what these guys went through at 18 and 19,” Shirley said. The LaGrange suffered the war’s last casualties about a U.S. ship. Stunned, Shirley wept bitterly. Her father cautioned her to wait before replying, and she did. Not long after, another letter arrived apologizing for the earlier missive and asking her to make wedding plans. On Nov. 11, 1945, while on a 30-day leave, Tom and Shirley were married at Pilgrim Lutheran in Spokane. When his leave was up, Tom returned to duty and the couple spent the first six months of married life apart. But after a few months in Illinois, he turned to Shirley and said, “Honey, I want to go home.” This time home meant Spokane. In 1950, Tom joined the Spokane Police Department and was assigned to the motorcycle unit. Shirley gave birth to three children; Douglas in 1947, Ronald in 1949 and Pattie in 1951. She worked for many years at a neighborhood pharmacy. After 25 years on the force, Tom retired and then took a job as an investigator for the state Department of Revenue. He was also very active in the Masonic Lodge, and in his 60s became an ordained minister, serving for a time as interim pastor of the United Church of Christ in north Spokane.